If you’re saving money for debt consolidation, retirement, your kids’ education or some other worthwhile goal, you have two basic choices. You can either find ways to earn more money like driving for Uber or you can be living frugally. Or, of course you can do both. But given today’s hectic world with its 50-hour work weeks, school activities, kids’ sports and all, most people simply can’t take on a part-time job. 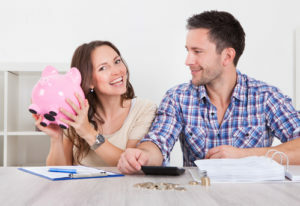 This leaves living more frugally, which is really not all that difficult if you use these seven tips. Gardening not only means living frugally it makes for healthier eating. Even a plot as small as 6’ x 10’ can produce a nice crop of tomatoes, lettuce, kale, broccoli, spinach, shallots, garlic and beetroot. The trick to picking which veggies to plant are choosing those that are expensive in the store and those leafy vegetables where you can cut off a few leaves and they will continue to grow (called cut and come again). Or you might also choose to grow things that are different and that you normally wouldn’t find in your favorite supermarket. If you have a car that’s reliable and paid off just keep driving it. Sure, it’s fun to have a flashy, new car but it can be very costly. For example, the website Edmunds.com says that the average monthly payment on a new car is $479. Multiply this by 12 and you’re looking at $5748 a year, which would actually be enough to buy a reasonably decent used car. When you buy a new car you pay its retail price but when you drive it home, it becomes worth only its wholesale price, which means it’s immediately lost about 20% of its value. Think about this for a minute. If you pay $18,500 for a new car the minute you drive it off the dealer’s lot its price drops to $14,800. In comparison, driving an older car for as long as it remains reliable means both saving money and living frugally. You’ve undoubtedly heard the old saying that “one man’s trash is another man’s treasure”. And this is no more true that at yard and garage sales. You can actually find some great buys at these sales if you know what you’re doing and shop carefully. You could find things like small appliances, baskets, flower pots and toys that could help with your living frugally. Or you could do what many people do and that’s look for things you could resell on eBay. There’s good money to be made doing this especially when it comes to electronics and collectibles. However, you will need to do your homework first, which means spending time on eBay to learn what things sell for. For example, that “Legendary Lou Gehrig 23K Gold Bordered Commemorative Plate” marked for $.50 at a yard sale could be worth more than $35 eBay and many other items can also have these kind of values. Instead of buying expensive gifts why not make them yourself? Quilting and knitting is actually something you could do while watching television instead of just sitting there staring at the tube. If you have a small workspace, some tools and a little imagination you could make homemade toys to give as gifts. When you do this you’re not only living frugally you’re putting something of yourself into the gift and not just buying it at the nearest warehouse store. If you sew or learn to sew you could make any number of clothing gifts such as scarves, hats, doll clothes and “fun” socks that people would love because they would be one-of-a-kind instead of something that had been mass-produced in Pakistan or Viet Nam. The abundance of credit cards makes it just drop-dead easy to get into debt. And if you’re not careful you could get into a lot of debt. You may have to borrow money to buy a house or a good used car but that should be about it. If you have multiple credit cards, put away all but one and use it only to buy things when you don’t have enough cash on hand to pay for them. Make sure you only charge what you can pay off at the end of every month. Paying off your debt means having more money to save for retirement, to give to your favorite charity or for some other worthwhile goal. When you stop to think about it watching TV is actually a solitary thing. You family could be watching a program together but you’re really each watching it separately. Turning off the TV means finding ways to do more things together – from playing a game of Uno or Monopoly to going out together to pick out a Thanksgiving turkey. When you cut down dramatically on your TV watching you should be able to save money by “cutting the cable” and getting your entertainment from Netflix. Amazon or Hulu. You can get all your local channels free just by buying a small antenna. This would give you access to all the network shows, plus some other local programming. None of the tips you’ve read here would cause you to live like a pauper but together they could save you a good deal of money. If you put your mind to it it’s likely you could find a number of different ways for living frugally to save money . All this takes are time and a little imagination.